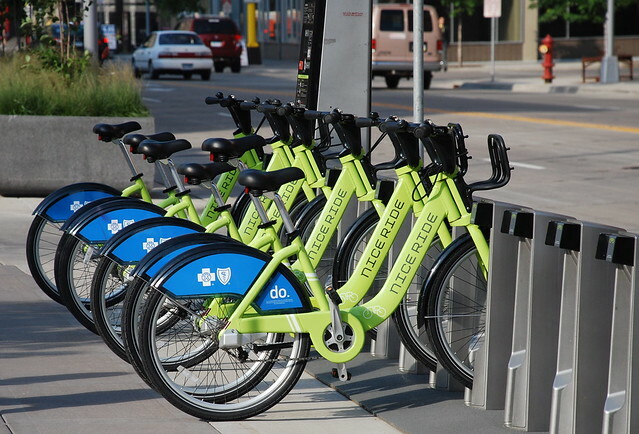 When bike sharing systems started popping up across North America, I got excited. I knew bike sharing had improved life in European cities by offering people a convenient way to get around town on short trips. ?It’s like a whole new kind of transit system on two wheels,? explained a friend who?d used the system in Paris. But I never imagined myself renting bicycles from automated stations. They?re for people who don’t own bikes, right? Why would I pay for bike sharing when I have bikes of my own in the garage? In the four years since bike sharing hit the streets here in Minneapolis, I?ve discovered many reasons why it’s nice to have instant access to a bike wherever you are. For those times when you arrive somewhere by foot, on transit or in someone else’s car and then want to pedal back home. Those times when the folks you drove with want to leave earlier–or later?than you. Or they are headed in a different direction afterward. Bike sharing is also handy when you ride your bike and then want to go somewhere else with a friend who didn?t. But, most of all, I appreciate bike sharing when I?m traveling. The sheer wonder of being able to hop on a bike anywhere I happen to be first dawned on me last year in Ottawa, Ontario. I had just a few hours before leaving town and wanted to see the sights. I quickly realized that I wasn’t going to cover much ground on foot. As I was weighing the cost and hassle of renting a car, I suddenly spotted a bike sharing station. Hurrah! With a quick swipe of my credit card, I was cruising through downtown, around Parliament Hill, along the Rideau Canal, visiting the historic market, touring Notre Dame cathedral, stopping by Chinatown for lunch, crossing over the river to explore Quebec. Since then, bike sharing has boosted my fun on vacations and work trips. In Washington D.C., I visited the National Zoo. In Brookline, Massachusetts, I explored stately old neighborhoods, including JFK’s boyhood home. In Boulder, I followed a creekside trail to a state-of-the-art bike park. In Des Moines, I discovered an old Italian neighborhood. In Kansas City, I found art galleries and brewpubs. I?ve also saved time and money by biking to business meetings. Pedaling a bike around a new town, I feel a part of the place, not merely an observer behind glass inside a car or a bus. Now, as bike sharing spreads across the continent, we?ll all enjoy more opportunities to explore wherever we happen to be.